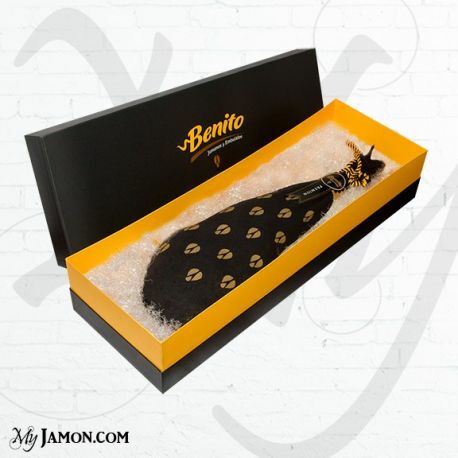 The Benito Garcia Iberian Pure Pata Negra Premium ham from Jabugo, comes from a small and careful selection of about 500 pure Iberian pigs, graze in total freedom in the breeding of San Nicolas del Puerto, in province of Seville. These types of selective breeding give greater autonomy to the pig, which has available several hectares of land full of oak trees and feeds on acorns during the winter and later in natural resources, can then consume daily about 8 -9 kg acorns available, when normally the rest of the Iberian pigs will eat about 7 kg. This produces a greater rate of oleic acid in the animal, once completed the autopsy which determines the level of purity and oleic acid possessed, for which the level of acorns assumed is significantly higher compared to those consumed by the rest of the Iberian pigs and It is classified as Pata Negra precisely according to the new legislation. The secret of this ham 100% Bellota or acorn, is the kind of natural food and full direct only individuals of pure race, especially during the time spent in pastures in the era of Montañera, from October to February, when precisely it acorns found in nature. This extraordinary combination of race and power brings the distinctive flavor that distinguishes this piece from the rest of the Iberian hams. A further element that differentiates this ham from the others, is the length of the paw due to the delayed process of sacrifice, which is carried out with the purpose of obtaining a higher quality product. As for the curing period, this Pata Negra ham respects the ancient traditions handed down from century to century by about 200 years. Once the period of drying the pieces are moved in the cellars of Castano de Robledo in the village of Jabugo, in the province of Huelva, to be supervised carefully, one by one until you reach the point of perfect quality. Buying a Jamon Iberico Pata Negra Pure Premium Benito Garcia from Jabugo you purchase a genuine and unique flavor, with a high proportion of acid which determines the characteristic intense flavor. Mi gran afición al jamón me ha hecho probar muchísimos de ellos, de diferentes características y lugares... Pero no recordaba ninguno tan impresionante como este.